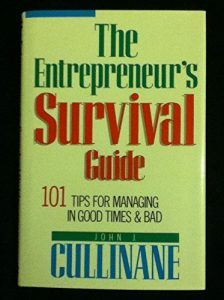 John Cullinane formed the first successful software products company in the computer industry at a time when industry gurus said that it couldn’t be done, others had tried and failed, and so would he. However, his company’s IPO succeeded so dramatically that it proved to Wall Street, and the computer industry, that a great deal of money could be made from treating software as a product. Many software companies followed and an industry was born. However, like any entrepreneur, he had to manage his company through the four phases of any new venture which always begins with the idea, then the struggle to bring the idea to life, the heady success days when it all works, and the inevitable days of trouble. That’s what the Cullinane Active Archive is all about. Providing a body of information that is easily accessible that will help entrepreneurs no matter what stage of the entrepreneurship process they may be at. This, most importantly, includes both a messaging page as well as a values page that emphasizes that integrity is not a burden but rather a great asset to any enterprise. The Active Archive includes as many videos and podcasts as possible with John explaining the material first hand. This includes key videos and papers associated with both his remarkable corporate and social entrepreneurship initiatives. These include major events and awards, but also includes a featured partnership and family page. This is because family members are often a big part of any entrepreneur’s undertaking. 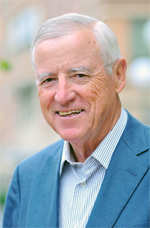 As a social entrepreneur, John created the Boston Public Library Foundation, was the first President of the John F. Kennedy Library Foundation, and the Founder of the Friends of Belfast. He also was a member of the Aspen Institute’s Middle East Strategy Group. John is a graduate of Northeastern University and an Honorary Degree recipient. 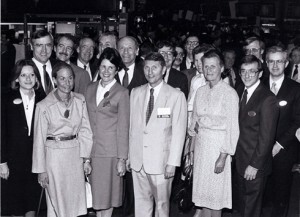 Cullinane Board members, management, and spouses on the floor of the NYSE watch first trade of company stock on ticker. Video – Financial Management Network Interview of John Cullinane regarding his paper. John was heavily involved through the peace process with the advocacy of jobs and economic development, which were key to peace. With 65% unemployment in high violence communities, it was the only subject that both sides could agree on. 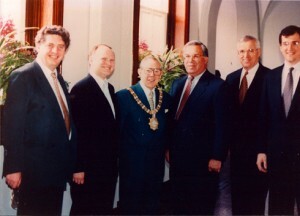 Social entrepreneurs working the Boston/Belfast connection for jobs for peace – Dr. Allisdar McDonnell, Frank Costello, Lord Mayor Hugh Smythe of Belfast, Mayor Thomas Menino of Boston, John Cullinane and John Cullinane, Jr.
John Cullinane was the Founding Chairman of the John F. Kennedy Library Foundation and also the Chair of the International Visiting Dignitaries Series when Nelson Mandela visited the Library on his first stop in America. 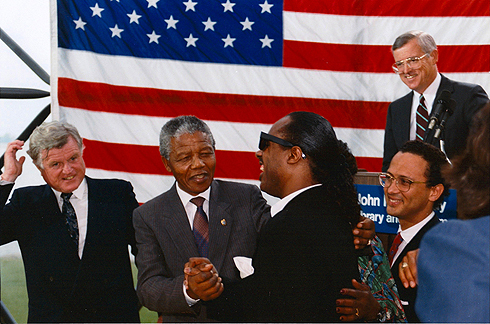 Nelson Mandela visits JFK Library after 27 years in prison – greeted by Senator Kennedy and Stevie Wonder with John Cullinane, MC of the event, in the background.